A weekend isn't complete without a bit of exercise, is it really? In the fresh air I mean... Yesterday, being blue of sky and a bearable 12°C, was just the day for mountain-biking. Not too strenuous biking, however, after making merry for most of the previous day (lunch, tasting, dinner). I looked at my book and found a circuit that one couldn't get lost doing as it was there and back along the beach. No tall trees with split trunks to look for, or gated paths, or ruined shacks, or village green now become a car park. No, the instructions were, go to the beach, park the car, walk along the beach for as far as you like, turn round and walk back. Feasible on a mountain bike too. Perfect! We piled my beautiful new bike into the boot, and that of my TWDB which is a nifty folding one, and I drove first to Grau du Roi, and then along to Espiguette. 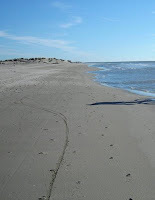 It's a huge beach with dunes extending for several kilometres. You have to park in the compacted sand car park (payable in season) and then walk and walk and walk for as long as you want, but best to remember everything you need. It's not like you can just nip back for the sunscreen. Beaches are quite tricky places for cycling, even with a dead nifty mountain bike. Even at the water's edge, it's not necessarily hard enough to cycle easily. We managed to keep going for a couple of kilometres then hunger got the better of me, and we stopped for a picnic. A picnic on the beach in December - I just love living in the south of France. We had stopped at the local market for some authentic St Nectaire Fermier, and I'd also bought a Festive baguette, brought along some tomatoes and sweet onion, a little wine (end of the previous evening's Chateau LaRoque...) and the end of the barbecue flavoured crisps. A banquet! We sat there, in the sun, on the beach, all warmed from our exercise enjoying excellent cheese, and lovely crunchy, tasty bread. Cool. Then we turned round and rode back again. Well, we only needed a little exercise... When we got back, someone was practicing handbrake turns on the compacted sand in a Renault Espace. Two young men - no surprise there... They looked like they were enjoying themselves mightily and it reminded me of the time, many years ago, when I was doing the same, in an Alfa GTV - empty car park, powerful car, daredevil attitude. It's just too tempting!